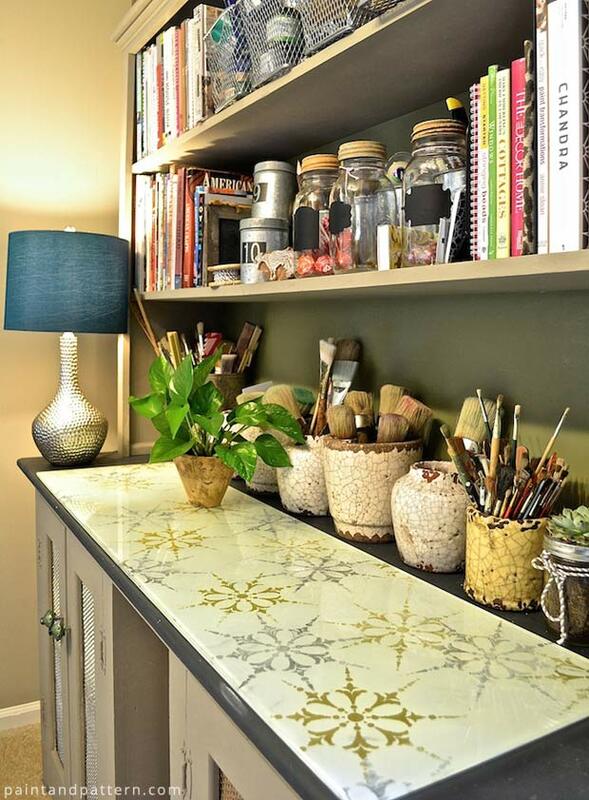 Do you truly require aesthetically pleasing surroundings to feel more comfortable and efficient? Me too! Many years ago when I managed a creative staff, I learned during some evaluation sessions that I my aesthetic values are very high. And yes, I work happily and efficiently in areas that I find artsy, creative and inspiring. During the past year, as I started my new consulting and blogging company, My Patch Of Blue Sky, I made the decision to work from home. Tough, tough decision. I thrive on getting up and going to work every day to interact with other humans. But, at home we have room for me to have an office and a little art studio. No brainer. I have added important elements like storage and good lighting in the studio, and I am done decorating. 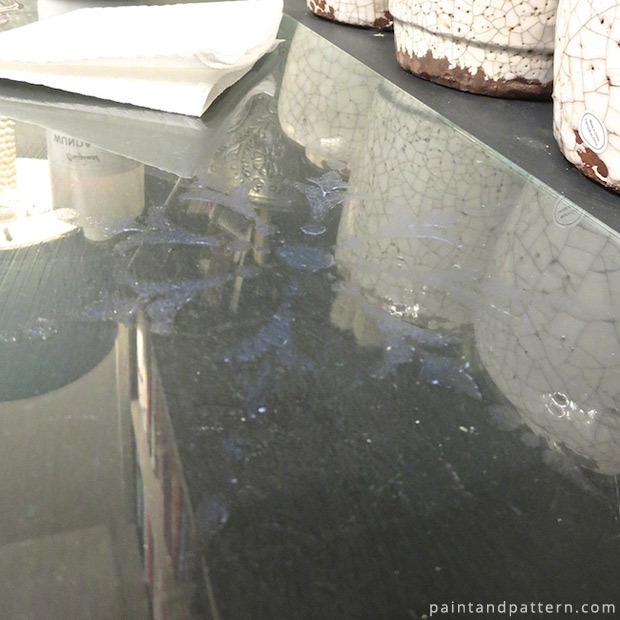 But, this large piece of tempered glass on the sideboard has been bugging me. It’s like a visual black hole. I use it as a cutting surface and a photo staging area and it is UGLY! So I studied the Royal Design Studio stencil patterns and chose this pretty Stargazer Medallion design, which is perfect for Christmas, though I like it year-round. Heavy, tempered glass with polished edges – I found mine at a used fixture store for $10. 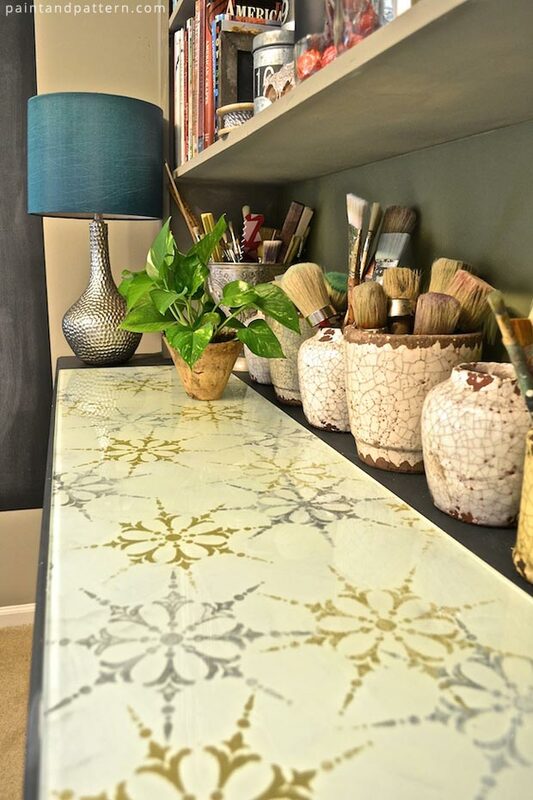 Consider yard sales for old tops used on sideboards and tables. Regular glass, like that in frames, is not tempered and can break and shatter more easily. Clean the glass and wipe it dry. 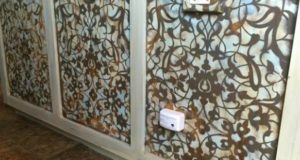 Decide if you want to cut your stencil closer to the pattern, so you don’t have to wait for each pattern to dry before you place part of the stencil on top of another design without smearing. I cut mine and saved the cutout to tape back on later. Lay the stencil down. 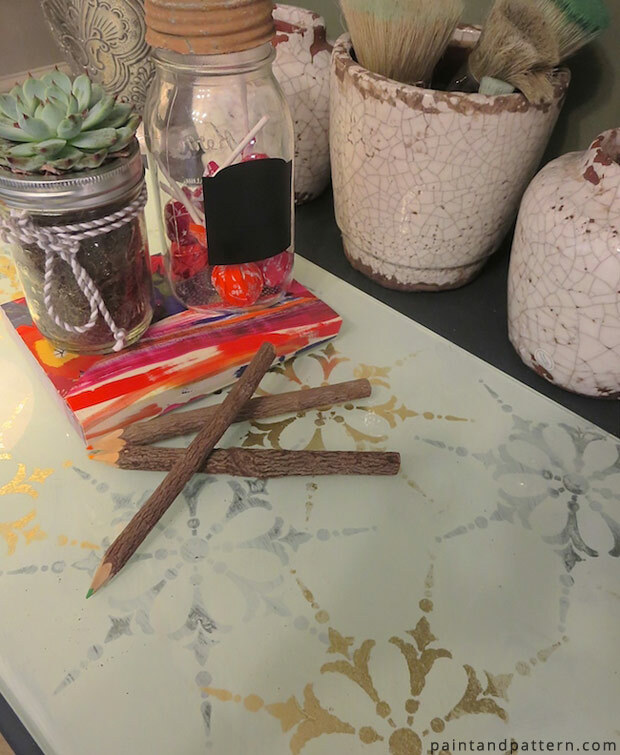 Pour a bit of Stencil Size into a container, then stencil on a thin layer, off-loading excess Size on paper towels. 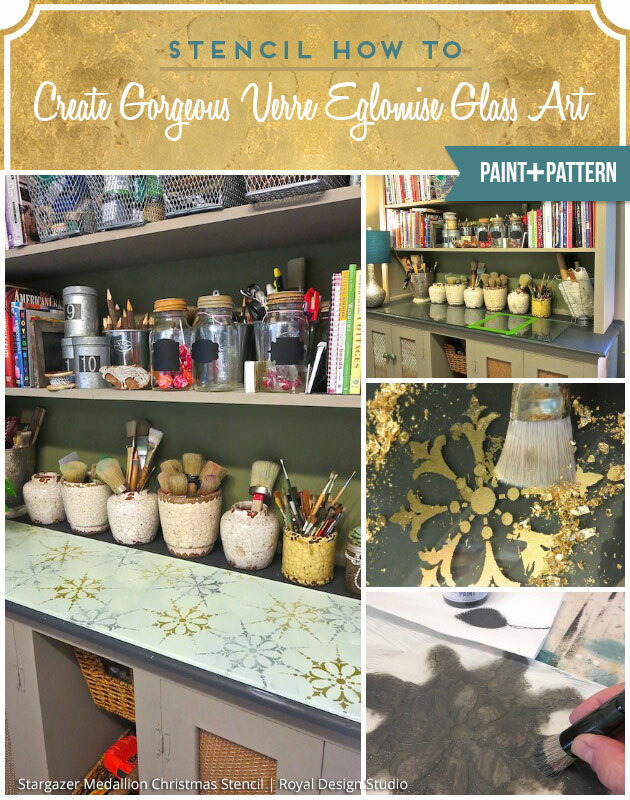 Fill up the surface of the glass with patterns. It will be somewhat difficult to see your designs, so bend down and look toward the light to help place each design. Let come to tack for about 15 minutes. Turn off fans and close windows in order to keep the gold leaf from blowing around. Pick up one square of leaf and place it on top of a design. 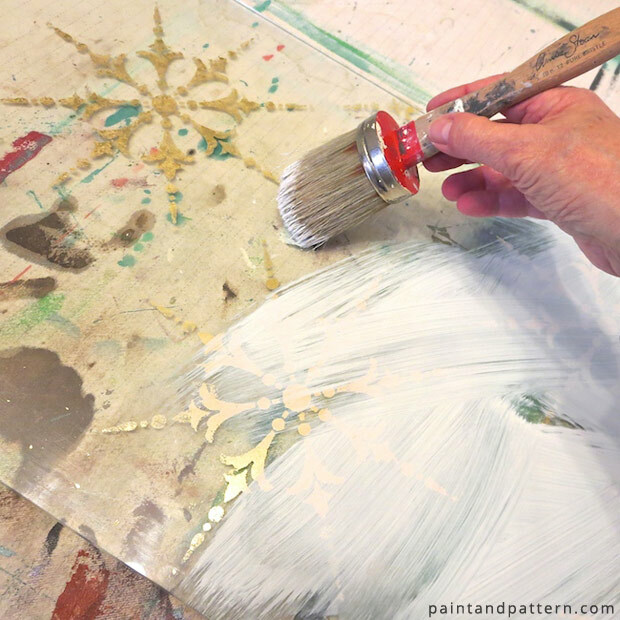 Use your hand to compress into the size, then use a soft brush to gently remove the areas of gold leaf that have no size. You can move the tiny bits that come up over to the next pattern with your hand. When the surface is complete, burnish the leaf tightly to the surface with a piece of crumpled wax paper. You can see that I did not attempt perfection since I like everything on the rustic side. Create a wash using some Old White with about 20% water. Brush it on, skipping some areas. Let dry. 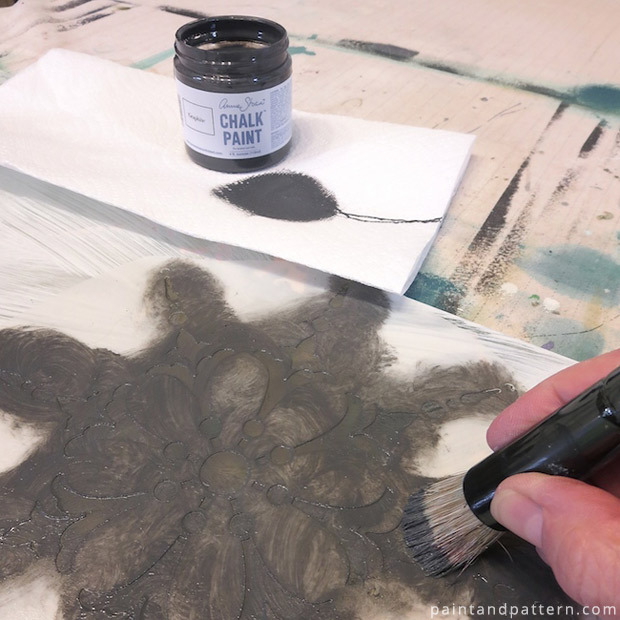 After cleaning the stencil, use it to stencil patterns randomly with one coat of Graphite. Let dry. You can set the glass up on its side to see areas you want to stencil. 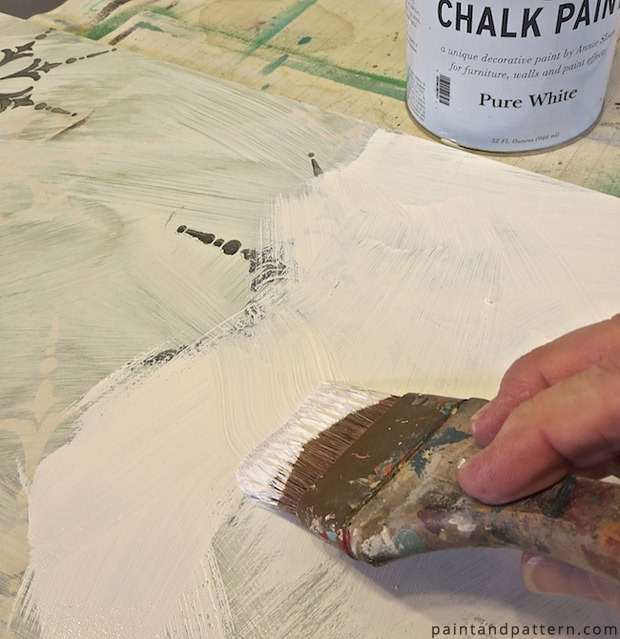 Brush on a coat of Pure White Chalk Paint®, covering the surface completely. Let dry. 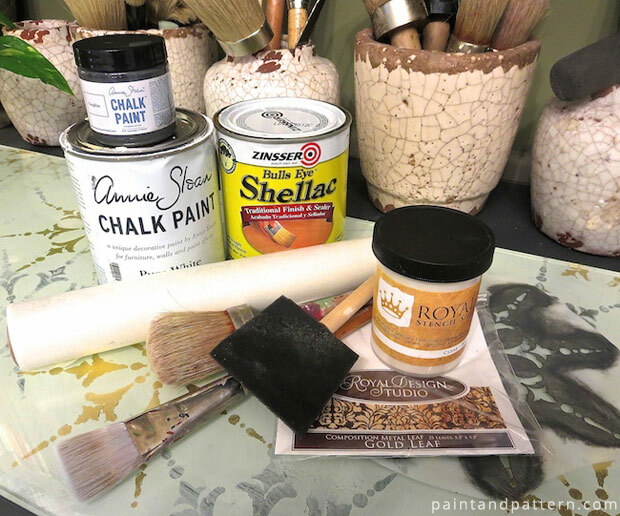 Use a throw-away foam brush, coat the surface twice with shellac. It dries quickly and will help protect the painted surface. For my sideboard, I don’t need super heavy-duty protection. 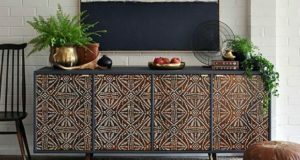 OPTIONAL: If you want to use this piece to serve food, or as a centerpiece, use another foam brush or disposable roller to roll on a coat or two of black enamel. This will allow you to wash it more aggressively and protect it from scratches. It needs to dry over night. Both the shellac and the enamel are pretty stinky, so do this in the garage or basement or outside on a nice day. Add four or more felt pads to raise the glass off the surface. Clean the edges with soap water or a sharp blade. I am thrilled that this former eyesore is now a beauty. Plus, I can move it to the kitchen or living room during the holidays for entertaining. Picture wine and cheese! 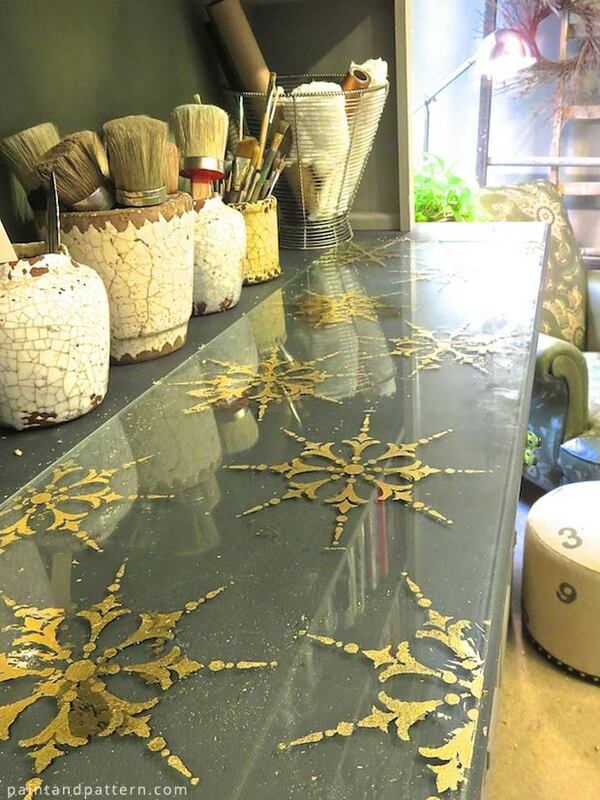 Love using Gold Leaf? 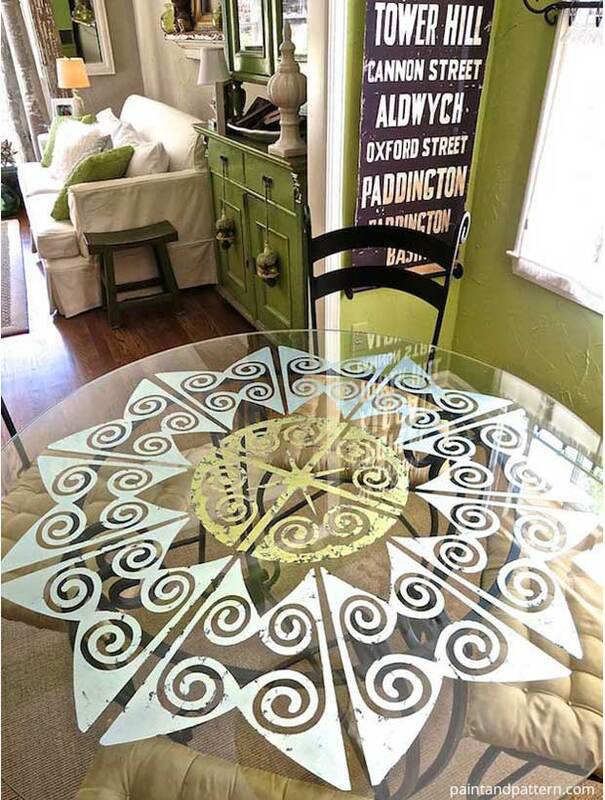 Here is my kitchen glass table project that you may want to check out as well for a different look. The cool thing about these projects is it helps discover stencils I never noticed before! I love the collection of crackled pottery jars too. issues to enhance my website!I assume its adequate to use some of your concepts! !